Claudia Steiner never intended for her life to become such a disaster. At the age of twenty-nine she finds herself serving as secretary to an insane, aging socialite who barks orders from her toilet, specializes in devastating backhanded remarks, and expects Claudia to ghostwrite her best-selling novels. Her job pays enough to keep her in overpriced cocktails, cabs, and take-out but doesn’t cover the rent on her roach-infested apartment or keep her creditors at bay. Her romantic prospects are no better. She’s hopelessly in love with her best friend, a corporate lawyer who may or may not be gay, and she’s still relentlessly pursued by her ex-lover, a married unpublished epic poet. All Claudia can rely on–aside from her wry sense of humor and her faith in the medicinal properties of whiskey–is a persistent little flame of belief in herself, which gives her the glimmer of a chance for a happy ending. Christensen’s acid wit burns up the pages. An artful chronicle of a frustrated writer who finds herself light-years from where she expected she’d be. Claudia Steiner has to be the freshest anti-heroine I’ve read in a long time. Like its protagonist, Christensen’s book is funny and intelligent, filled with dead-on New York character types and locales. Hilarious, decadent, painfully honest, and sparkling with wit and originality…With this exuberant first novel, Kate Christensen burst onto the literary scene. Like Bridget [Jones], Christensen’s Claudia Steiner is a mess…but Claudia is endearing because she remains appreciative of her own grittiness. A breezy and confident first novel. Christensen’s narrative voice is sharp, urban, and laugh-out-loud funny. At a time when authors are penning bestselling memoirs about their alcoholic torment, and 12-step programs are as popular as SUVs, Christensen’s take is refreshing. 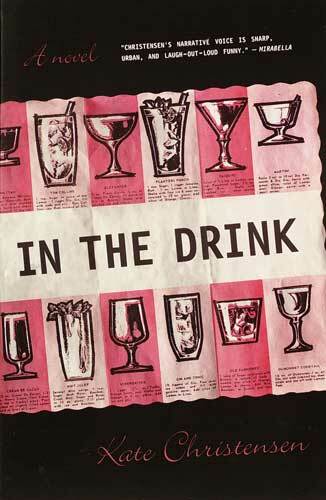 Read In the Drink because it’s about a girl who knows exactly how it feels to be us. For a change.